The Garmin Nuvifone G60 Smartphone isn't just your regular cel phone. It also has a GPS system and also has touch screen capabilities equipped with a virtual keyboard and virtual buttons. 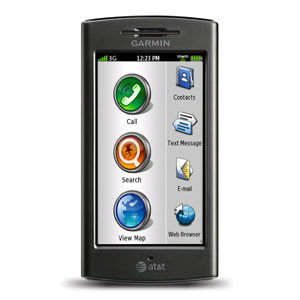 Garmin has coined this system as a "hybrid handset" and it is easy to see why. The Garmin GPS navigator is automatically turned on once placed in it's car mount. The great thing is that even with the GPS working, you can still make and receive hands free phone calls. The cell phone camera also comes equipped with geotagging. This means no matter where your pictures are taken the system will be able to tell you where the images were taken. Spoken turn-by-turn directions announce streets by name just like a Garmin nüvi personal navigation device. Find people, addresses, businesses, and navigate there. This Garmin Nuvifone G60 Smartphone is the first time the company has made a GPS tracking device available with a phone, and is the first of it's kind in the industry. Garmin has been a well known producer of exceptional GPS tracking systems, and now they will have a stake in the smartphone industry as well. The only 3G phone to fully integrate the world’s best-selling GPS navigator with voice, data and mobile web.